The Wandering horses are back! Until June 25th, collect wandering horses and collect their prizes. To get a wandering horse, fill their points meter by performing the requested action as many times as needed. 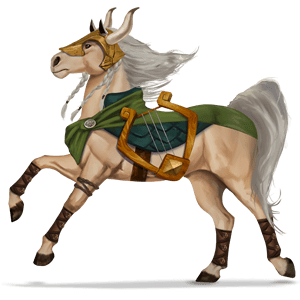 Some actions require you to take care of wandering horses in your breeding farm, and you can age them with treble clefs. Wandering horses will unlock as the promotion goes on. There are 11 wandering horses this time. Hip-Hop, Punk Rock, Blues, Reggae, R&B, Metal, Opera, Country, Electro, Funk and Jazz. Some of them are quite easy to obtain, like Punk Rock requires you to congratulate players. Others are harder, like Reggae, which requires you to age your wandering horses with treble clefs. This round of wanderers will be at least 20 passes to finish (my estimate). Try to get as many wanderers as possible before you start on Reggae. Get all the wandering horses to obtain Bragi. Bragi is the newest nordic divine. Lift the veil that has ascended on the Nordic worlds by winning points with rides to Asgard, Midgard or Nilfheim. Take care when choosing which ride to go on. When you get to 900 points, the veil is raised and Bragi gives you one Harmony Pack. Good luck, and enjoy the musical wanderers!